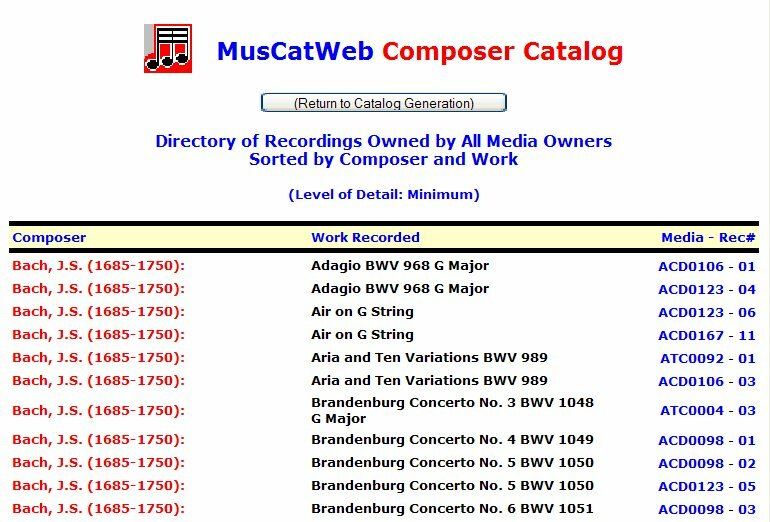 MusCatWeb is a browser-based music cataloguing system of interest to people who own large collections of recorded music, sheet music and/or books. MusCatWeb is a freeware web application designed in such a way that it can be used without your computer actually being connected to the Internet. All you need to know is how to use a browser program, such as Internet Explorer. What's required on the computer? MusCatWeb requires an Internet Browser to be available on your PC, such as Internet Explorer or Netscape. MusCatWeb also requires a Web Server program to be available on your PC, such as Microsoft's Personal Web Server (PWS) or Internet Information Server (IIS). If you are using Windows 95, Windows 98, Windows ME or Windows NT, you will need to have PWS installed on your PC. The MusCatWeb documentation tells you how to achieve this. If you are using Windows 2000 or Windows XP Professional, you will need to have IIS installed on your PC. The MusCatWeb documentation tells you how to achieve this. If you are using Windows XP Home Edition, you are out of luck, because Windows XP Home was not designed to support IIS. The MusCatWeb documentation contains further comments on this, including a possible workaround. MusCatWeb keeps its data in a database stored locally on your PC. 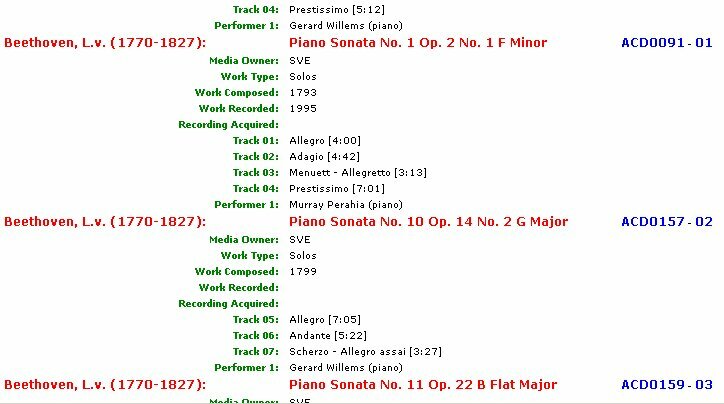 In an effort to reduce the amount of data entry required on your part, the database has been pre-loaded with a significant amount of data about composers, works and performers. Short of time? Well, I know the feeling. Depending on your level of ambition and the amount of time you are prepared to spend on entering and maintaining data in the MusCat database, you can use MusCatWeb at essentially three levels, without necessarily spending much time at all. Minimum Level. At this level, data entry is absolutely minimal, just enough for producing basic media labels (it should take you less than 3 minutes per CD), but on your shelves you may now have this kind of CD library with nice and readable spine text for each CD. Medium Level. To get more out of MusCatWeb, you may choose to add a small amount of other data (often by selecting from already pre-loaded data) about your recordings. This will most likely take you 5-10 minutes per CD, but it will allow you to produce more informative media labels, ready for cutting out and insertion into jewel cases. You will also be able to produce a basic music catalog (picture shows small extract only), so your friends can choose which piece of music they would like to listen to (and, what's more, you will be able to find it in no time). Maximum Level. Moving on from the Medium Level, in order to tap into the full potential of MusCatWeb, you have the option of entering more data about you recordings, such as track durations, performers, etc. 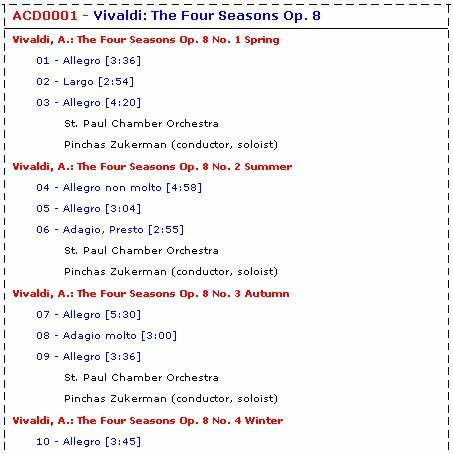 That may take another 5-10 minutes per CD, but your comprehensive labels now tell you at least as much as the small commercial printing usually found on the back of a CD jewel case. In addition, your comprehensive music catalog (picture shows small extract only) will now be truly impressive and useful. In order to make it easier for you to perform Steps 2, 3 and 4 exactly as listed below, I recommend that you print this page first. Press the print button on your Browser toolbar and collect the hardcopy before you continue. Click here to download the self-extracting muscatweb.exe file. During the download you will be asked to specify the name of a folder in which to save the file (e.g. C:\Windows\Temp). After the download has completed, open (double-click) the folder in which you saved the muscatweb.exe file. Then double-click the muscatweb.exe file to extract (unzip) all the files that make up MusCatWeb. Unless you change the specified default download location, the files will automatically be placed in a folder named c:\inetpub\wwwroot\muscatweb (if this folder does not already exist, it will be created for you as part of the file extraction process). When the file extraction has completed, close the muscatweb.exe extraction window. Send me email if you experienced any problems during the download and extraction, so I can try to fix it. I would also like to know if any of my instructions were not quite clear. Before you try to execute MusCatWeb you might like to read a bit about it in the MusCatWeb User Guide, which can be found in a file named "c:\inetpub\wwwroot\muscatweb\User Guide.pdf". This document is stored in Portable Data Format (PDF) and can be viewed on screen or, better still, printed into hardcopy using the Adobe Acrobat Reader program. If you do not have this program on your PC, click the link to download it for free (you only need to do this once). At this stage just read the Introduction chapter and then go on. If you already have either the Microsoft Internet Information Server (IIS) or Personal Web Server (PWS) installed on your PC, you are ready to try out MusCatWeb straight away. If you do not yet have either IIS or PWS installed, please consult the MusCatWeb User Guide to find out how you can install PWS or IIS. With IIS or PWS available and running on your PC, start your browser and browse to the MusCatWeb home page at the following location on your computer: "http://localhost/muscatweb/Default.asp". This should display the MusCatWeb home page. If it doesn't, you'll need to consult the User Guide. On the MusCatWeb home page select the "Use My MusCat Training Database" option and press the �Click here to display the MusCatWeb Main Menu� button. You will then be logged into your MusCat Training database, on which you can do some testing and experimentation to find out if MusCatWeb is for you. On the MusCatWeb Main Menu, click the �Maintain Composers� hyperlink to load the �Maintaining Composers� page. Enter your name in the field labelled �Enter New Composer/Creator� and press the �Add� button. 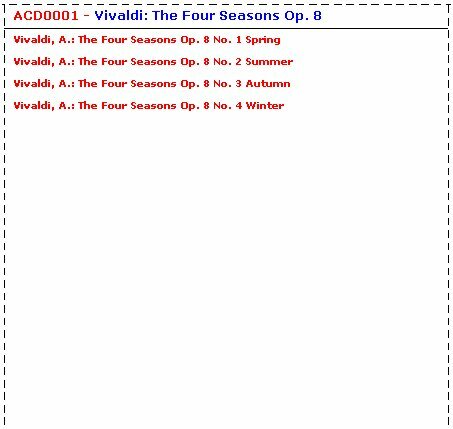 If this is successful, voila, you will have added yourself to the drop-down list of composers. Did it work? If it did, you might like to delete yourself again, unless of course you are in fact a composer. Send me email about any problems with MusCatWeb, so I can try to fix it. 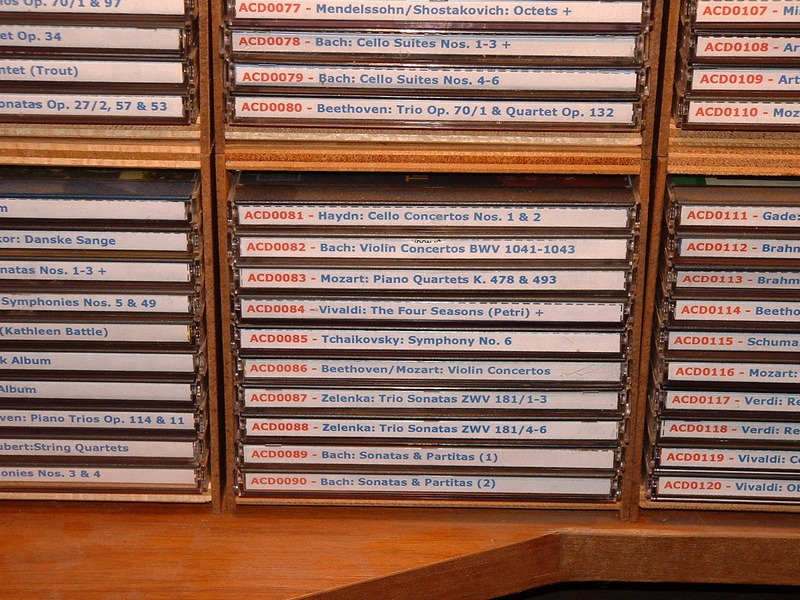 Use the Case Study to learn enough about MusCatWeb so you can decide whether or not you wish to use MusCatWeb for cataloguing your musical recordings, your sheet music and/or your books. I hope you will have success with downloading and executing MusCatWeb, and I hope you find MusCatWeb enjoyable and useful.